Definition at line 29 of file CQOptimizationResult.h. 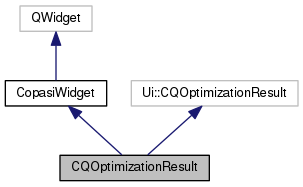 Definition at line 30 of file CQOptimizationResult.cpp. Definition at line 41 of file CQOptimizationResult.cpp. Definition at line 63 of file CQOptimizationResult.cpp. References C_FLOAT64, C_INT32, FROM_UTF8, CCopasiRootContainer::getDatamodelList(), CCopasiDataModel::getDataObject(), COptProblem::getExecutionTime(), COptProblem::getFunctionEvaluations(), CCopasiObject::getObjectDisplayName(), COptProblem::getOptItemList(), CCopasiTask::getProblem(), COptProblem::getSolutionValue(), COptProblem::getSolutionVariables(), COptProblem::getVariableGradients(), mpProblem, and mpTask. Definition at line 46 of file CQOptimizationResult.cpp. Definition at line 57 of file CQOptimizationResult.cpp. Definition at line 167 of file CQOptimizationResult.cpp. References C_FLOAT64, C_INT32, checkSelection(), CLocaleString::fromUtf8(), COptProblem::getExecutionTime(), COptProblem::getFunctionEvaluations(), CopasiFileDialog::getSaveFileName(), COptProblem::getSolutionValue(), mpProblem, and TO_UTF8. Definition at line 223 of file CQOptimizationResult.cpp. Definition at line 49 of file CQOptimizationResult.cpp. Definition at line 46 of file CQOptimizationResult.h. Referenced by enterProtected(), slotSave(), and slotUpdateModel(). Definition at line 47 of file CQOptimizationResult.h.